Most of me knows this post needs writing because of the lack of interaction and information most people have, but part of me is a little sad this needs to be said. Please know that I am sharing not to condemn, but to enlighten and well, to raise awareness, since that is what Down Syndrome Awareness Month is all about. As a woman who has worked with special needs children for more than half her life (see how I avoided years there? ), helping others learn non offensive terminology has been important to me for a long time. It got personal a bit over six months ago when we learned of Jubilee’s diagnosis. So, for my last post for this year’s Down Syndrome Awareness Month, I’d like to share some words we should say and words we shouldn’t say in referring to people with Down syndrome or in regards to Down syndrome. A person with Down syndrome. Not a Downs person. And not a Down syndrome person. A person with Down syndrome is a person first and foremost. Their syndrome is a part of them, it isn’t all they are. Person first language puts the emphasis where it belongs. Saying that my Jubilee is a Downs baby instead of a baby with Down syndrome sounds like we are arguing over semantics, but semantics matter and me hearing that you see her as a baby first matters to me. And it matters to most mamas I know. While it takes a bit more effort to use person first language, it’s worth the effort. Plus, see the next note. Down syndrome. Not Downs. Not Downs syndrome. In the past, the term mentally retarded was used to describe people with intellectual disabilities. Due to the negative connotation and stereotypes, that term is no longer used. So, choose intellectual disability, intellectual difference, developmental disability, cognitive disability, or cognitive delay when referring to the mental ability area for someone with Down syndrome. Annoying, unintelligent, messed up, or whatever. Not retarded. When we are less than impressed with someone or something and we want to use a disparaging word, retarded shouldn’t be the word. Attaching retarded to a negative comment is insulting and rude to those with mental challenges (formerly known as mentally retarded), who can’t do anything about their disability. It equates two groups that shouldn’t be equated. Someone was maybe clueless. Not retarded. Something is messed up. Not retarded. Someone may have been immature. Not retarded. There ya go. Four little vocabulary lessons. These apply to Down syndrome, but all but one of these could apply to lots of situations and people with disabilities of all kinds. For example, a child with cerebral palsy is not a CP kid. He’s a kid who has CP. An adult with a head injury causing cognitive disabilities is that, not a head injured retarded person. Do you see and hear the difference? These seemingly little changes in vocabulary make a big difference to those with Down syndrome and their families and community. I’d be blessed if you shared these mini lessons with your friends and family. They may not know. And that’s what raising awareness is all about. Are any of the little language lessons new to you? 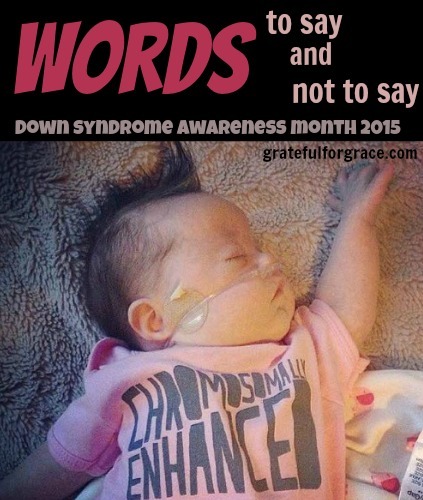 My only other post for Down Syndrome Awareness Month this year… here.